In modern scientific use, the term baboon is restricted to those primates that are members of the genus Papio. However, previously the closely related gelada (genus Theropithecus) and two species of mandrill and drill (genus Mandrillus) were grouped in the same genus, and these monkeys are still often referred to as baboons in everyday speech. Papio belongs to family Cercopithecidae in subfamily Cercopithecinae. In the informal division of primates into the three groups of prosimians, monkeys of the New World, and monkeys and apes of the Old World, the baboons are considered Old World monkeys. Baboons are some of the largest non-hominid members of the primate order; only the mandrill and the drill are larger. There are a number of genetic and physiological similarities between baboons and humans, including organ sizes, presence of menopause, and structures of major tissues. Like humans, baboons respond to stress through the release of stress hormones, and these two groups have about 91 percent genetic similarity. Because of such traits, baboons have been used to study obesity, heart disease, epilepsy, and other human diseases. A baboon liver has even been transplanted into a human. Nonetheless, the gulf between humans and baboons is immense, as people exhibit complex languages, complex technologies, and complex social behaviors (religions, politics, etc. ), among numerous other differences. The word "baboon" comes from "babouin," the name given to them by the French naturalist Buffon. Some consider the word baboon to have been derived from the name of the Egyptian baboon-god Babi. All baboons have long dog-like muzzles (cynocephalus = dog-head), close-set eyes, heavy powerful jaws, thick fur except on their muzzle, a short tail, and rough spots on their rear-ends, called ischial callosities. These calluses are nerveless, hairless pads of skin which provide for the sitting comfort of the baboon (and other Old World monkeys). 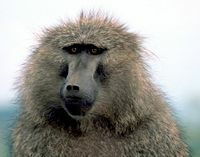 Males of the Hamadryas baboon species also have a large white mane. There is considerable variation in size and weight depending on species. The Chacma baboon can be 120 cm (47 inches) and weigh 40 kg (90 lb), while the biggest Guinea baboon is 50 cm (20 inches) and weighs only 14 kg (30 lb). In all baboon species, there is pronounced sexual dimorphism, usually in size, but also sometimes in color or canine development. Baboons are terrestrial (ground dwelling) and are found in savanna, open woodland, and hills across Africa. Their diet is omnivorous, but is usually vegetarian. They are foragers and are active at irregular times throughout the day and night. They can raid human dwellings, and in South Africa they have been known to prey on sheep and goats. Their principal predators are humans and the leopard, although they are tough prey for a leopard, and large males will often confront them. P. ursinus (Chacma baboon) is found in southern Africa. P. papio (western or Guinea baboon) is found in Senegal, The Gambia, and Guinea. P. hamadryas (Hamadryas baboon) is found in northeast Africa and into southwestern Arabia. P. anubis (olive baboon) is found in central African savanna, and P. cynocephalus (yellow baboon) is found in Angola, Zambia, Malawi, Tanzania, Kenya, and Somalia. The Hamadryas baboon was a sacred animal to the ancient Egyptians as the attendant of Thoth, and so, is also called the sacred baboon. However, there is some disagreement about whether these five groupings are really full species or subspecies. Some consider baboons to be a single species, which is designated Papio hamadryas (Comuzzie et al. 2003). In this taxonomic scenario, there are five subspecies: P.h. hamadyas (sacred baboons), P. h. cynocephalus (yellow baboons), P. h. ursinus (Chacma baboons), P. h. papio (red baboons or Guinea baboons), and P. H. anubis (olive baboons). 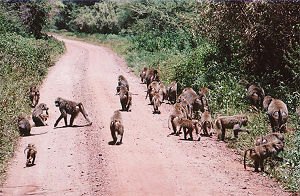 Many authors distinguish P. hamadryas as a full species, but regard all the others as subspecies of P. cynocephalus and refer to them collectively as "savanna baboons." However, while behaviorally and physically distinct from other baboon types, the Hamadryas baboon is known to hybridize with olive baboons, and recent phylogenetic studies of Papio show Hamadryas baboons to be more closely related to Guinea and olive baboons than to Chacmas (Newman et al. 2004). The traditional 5-form classification probably misrepresents the variation within Papio. Some commentators (Jolly 1993) would argue that at least two more forms should be recognized, including the very small Kinda baboon (P. kindae) from Zambia, the Democratic Republic of Congo, and Angola, and the gray-footed baboon (P. griseipes) found in Zambia, Botswana, Zimbabwe, Mozambique, and northern South Africa. However, current knowledge of the morphological, genetic, and behavioral diversity within Papio is too poor to make any definitive, comprehensive judgments on baboon taxonomy. Most baboons live in hierarchical troops of 5 to 250 animals (50 or so is common), depending on specific circumstances, especially species and time of year. The structure within the troop varies considerably between Hamadryas baboons and the remaining species, sometimes collectively referred to as savannah baboons. The Hamadryas baboon has very large groups comprised of many smaller harems (one male with four or so females), to which females from elsewhere in the troop are recruited while still too young to breed. The other baboon species have a more promiscuous structure with a strict dominance hierarchy based on the female maternal line. The Hamadryas baboon group will typically include a younger male, but he will not attempt to mate with the females unless the older male is removed. Baboons can determine from vocal exchanges what the dominant relationships between individuals are. When a confrontation occurs between different families, or where a lower-ranking baboon takes the offensive, baboons show more interest in the exchange than they do in the case of exchanges between members of the same family or when a higher-ranking baboon takes the offensive. It is speculated that this is because confrontations between different families or rank challenges can have a wider impact on the whole troop than an internal conflict in a family or a baboon reinforcing its dominance (Bergman et al. 2003). The collective noun for baboons is commonly troop or congress. There are, however, more subtle possibilities; males sometimes try to win the friendship of females. To garner this friendship, they may help groom the female, help care for her young, or supply her with food. Some females clearly prefer such friendly males as mates. A female initiates mating by “presenting” her swollen rump to the male. But “presenting” can also be used as a submissive gesture and is observed in males as well. In the harems of Hamadryas baboons, the males jealously guard their females, to the point of grabbing and biting the females when they wander too far away. Despite this, some males will raid harems for females. In such situations, it often leads to aggressive fights between the males. Some males succeed in taking a female from another's harem. Females typically give birth every other year, usually to a single infant, after a six-month gestation. The young baboon weighs approximately one kilogram and is black in color. The females tend to be the primary caretaker of the young, although several females will share the duties for all of their offspring. In mixed groups, males sometimes help in caring for the young of the females they are friendly with; for instance, they gather food for them and play with them. The probability is high that those young are their offspring. After about one year, the young animals are weaned. They reach sexual maturity in five to eight years. In baboons, males leave their birth group usually before they reach sexual maturity, whereas females are "philopatric" and stay in the same group their whole life. Comuzzie, A. G., S. A. Cole, L. Martin, K. D. Carey, M. C. Mahaney, J. Blangero, and J. L. VandeBerg. 2003. The baboon as a nonhuman primate model for the study of genetics of obesity. Obesity Research 11(1):75–80. Ghosh, P. 2012. Gorilla genome could hold key to the human condition. BBC News March 7, 2012. Groves, C., D. E. Wilson, and D. M. Reeder, eds. 2005. Mammal Species of the World, 3rd ed. Johns Hopkins University Press. Jolly, C. Y. 1993. Species, subspecies, and baboon systematics. In Species, Species Concepts, and Primate Evolution, edited by W. H. Kimbel and L. B. Martin. New York: Plenum Press. Newman, T. K., C. J. Jolly, and J. Rogers. 2004. Mitochondrial phylogeny and systematics of baboons (Papio). American Journal of Physical Anthropology 124(1):17–27. Scally, A., J. Y. Dutheil, L. W. Hillier, et al. 2012. Insights into hominid evolution from the gorilla genome sequence. Nature 483:169–175. Wildman, D. E., T. J. Bergman, A. al-Aghbari, K. N. Sterner, T. K. Newman, J. E. Phillips-Conroy, C. J. Jolly, and T. R. Disotell. 2004. Mitochondrial evidence for the origin of hamadryas baboons. Molecular Phylogenetics and Evolution 32(1):287–96. This page was last modified on 18 April 2014, at 01:38.